The quest for the perfect cigar does not always end in riches, but sometimes the accomplishment is in the journey itself. I rolled into Mexico last week with my wife and a couple of friends for eight days of R&R at a resort on the island of Isla Mujeres, off the coast of Cancun. Being in a tropical paradise and a country where Cuban cigars are legal, I obviously set out to find the perfect cigar. In the end, it was the experience of the adventure and the search for the cigar that yielded more enjoyment than the cigar itself. The first stop was the duty free-shop in the Cancun airport. I encountered the usual Cuban staples: Partagss, Montecristo, Romeo y Julieta. Three-packs and five-packs, most in the $50 to $100 range. A total rip-off. Are they even real? They had the hologram and the seal from Habanos, but I knew those were easy to fake. I decided to give it a chance though— given that I was in a duty-free shop and not talking to some vendor on the street, I figured the odds were slightly in my favor. I bought a three-pack of Romeo y Julieta No. 5 cigars for $25. “No,” I waved a hand. “Mnnesota.” I pointed to my baseball hat and quickly realized I’ve just pointed to the red and white Minnesota Twins TC embroidered on my hat, surely confusing the poor gentleman. He’ll never connect TC to Minnesota, I thought, so I quickly explain, “The Twin Cities.” He nodded and smiled and I’m not sure how much he understood, or how much he cared, because the next thing he did was point me to the cash register. I paid for my three-pack and the girl bagged my stogies in plastic and secured them with a twist tie. I passed through customs and an hour later, my party and I were on Isla Mujeres. I knew the island would be filled with cigars and vendors pushing them on every corner and after five minutes I knew that even if these Cubans were real, I wouldn’t want to touch them. The vendors cared for their cigars the same way I care for my dirty laundry. If there was a bin they could have used to toss these cigars in for their store for display, they would have used one. I saw boxes of cigars arranged outside on the steps leading into a shop, probably boiling to death under the 90-degree sun or sopping under the 90-percent humidity. I saw wrappers cut and wrinkled like the cigar had been carried in someone’s pocket. I saw gnarly, makeshift variety-packs where a Cohiba shared a box with a pair of cheap Montecristos and a handful of nameless mix-and-match cigarillos. The prices weren’t bad but these cigars were so unattractive that I was happy I brought a six-pack of Sancho Panza Double Maduros from home. 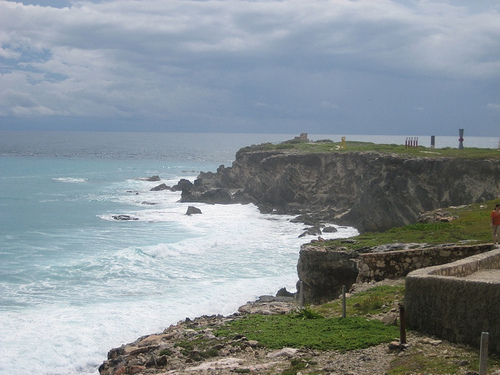 We sat on a cliff overlooking Mexico’s easternmost point, watching and listening to the waves, smoking Cuban cigars. After 15 minutes of peace and solitude unknown to the American hustle-bustle, it was time to move on. “How do you put it out?” they asked. “You don’t,” I told them as I gently placed my smoldering nub on the edge of the cliff. “Just let it go out on its own. Respect the stick. Leave it here, and let it be.” They did, and we walked back to our golf cart and began the journey back to our hotel. On the way back we passed a small baseball stadium with a capacity of probably 5,000. There was a bronze statue of a baseball player outside but we passed it too quickly for me to read the name. Then I realized, they have their own baseball heroes in Mexico. Their own great games, their own legendary moments. Mexican baseball was a whole new universe, and one where I could happily spend a lifetime. When we got closer to our hotel, the vendors appeared with their calls to Cuban cigars. But aside from the Romeo y Julietas, the Sanchos were all I smoked. Sure, the vendors are constantly pointing to their, “Cigars! Cuban cigars!” They think that since you’re a guy, you’re going to jump all over them but these guys are clearly marketing to the cigar-ignorant, and based on the volume of product available, this is a market that thrives. Sadly, I never found the perfect cigar. Sure, the cigars from the airport were good, but I was hoping to try an authentic Cohiba Behike. All I encountered was the bottom of the bargain bin. As I stared into the blue water I realized that every quest does not end in glory, especially the quest for the Holy Grail. My crusade would have to continue on another trip, to be resumed on my next journey overseas. Until then, I could only relish in the excitement of the search and the anticipation of another adventure. –Mark M‘s latest project is a comic anthology called Germ Warfare. Thanks for the article, Mark. I visited Isla Mujeres back in 2007 and also encountered many vendors peddling questionable sticks. I bought some fake Cubans — knowing at the time they were fake — just for the heck of it. They tasted terrible. I was just on a cruise and the only place I bought my Cubans were at la casa del habanos. It's the best bet you have for getting authentic Cuban cigars. My favorite so far from the trip was the Trinidad robusto T and the Cohiba siglo II. I bought a few others including the BHK 54 but im going to wait a while to smoke the rest. My palate needs a small break from all the smoking I did.